The iPhone 6s and 6s Plus: Are they worth the upgrade? It’s the standard s model upgrade, but it does have a few extra tricks up its sleeve. It's the inside that counts, but is that enough? Verdict: More of the same on the outside, but some considerable improvements on the inside make this a good upgrade for non-iPhone 6 owners. Where do you start when you talk about the iPhone? At this point, you know what you’re going to get, what the experience is going to be like and the kind of improvements each one brings. The s range of iPhones tends to be evolutions rather than revolutions, upgrading the hardware and refining other features from last year’s range instead of bringing any major changes. That said, the latest iPhones do have a few new tricks up their sleeve, but is that enough for people to upgrade? As far as looks are concerned, it’s more of the same as before. The mostly-aluminium design and smooth sides is the same template as the iPhone 6. The placement is also the same with headphone jack, lightning cable and speakers at the bottom, power button and SIM slot on the right-hand side and silent mode switch and volume buttons on the left. Saying that, it’s still very well designed and nice to hold, but there’s nothing exciting about it. It’s a little bit heavier and sturdier when compared to the iPhone 6, but it’s not noticeable unless you’re comparing the two. The only blemish is the LED screen resolution which, while sharp andcolourful, is virtually unchanged from the iPhone 6 and lags behind the 4K screens found in rival devices. The iPhone 6s Plus design. Yet while the outside hasn’t changed at all, its hardware powering has received a significant upgrade. Using a 64-bit A9 chipset and an upgraded CPU (a dual-core 1.84GHz) is good, but the real change is the jump from 1GB of memory to 2GB. That might not sound particularly great, especially since most high-end Android devices now have 3GB or 4GB of RAM, but in this case, it makes a world of difference as it can handle more tasks at ease. Everything is faster too – which, let’s be fair, is the minimum you should expect from an upgrade – but in this case, faster means extremely quick. Apps load up almost instantly, even with heavy animations, and there was no hint of it having any trouble handling even the more resource-intensive apps like games. In some cases, it’s almost too fast like with the fingerprint scanner. Pressing the home button to bring up notifications can end up unlocking the phone at times, which can be slightly annoying if you just want to glance at notifications. That feels like a petty complaint as the fingerprint scanner is consistent in recognising fingerprints. Despite a slight drop in capacity, the battery life is still consistent with last year’s model. That is: mixed use will get you through a standard day, but you will have moments where that might not be enough to last. To be fair, that’s something even its rivals have problems with, and features like Low Power Mode and battery usage overview do help a little. Yet the biggest gripe is one that has been around for a while. The minimum 16GB size is a pittance, and the lack of a 32GB option – you have to jump to 64GB if you want more storage – is tough to take considering how many of its rivals offer such an option. Some games like AG Drive use 3D Touch. In this case, pressing hard on the accelerator activates boost mode. While the main home screen of iOS 9 hasn’t changed since the early days, everything else around it has. Widgets are now at the top, a quick control panel can be swiped up, and now a left to right swipe brings up Proactive, a way for it to suggest and find contacts, apps and news. There are some teething problems, but it’s mostly consistent and the update to iOS 9.0.2 helps matters. There are a few noticeable inclusions, first-party apps like Notes and Maps have been updated, but the one that has received the most attention is 3D Touch. It’s still very much in its infancy, yet it’s one you feel will become very useful as more apps (and devices) adopt it and use it in more creative ways. You may forget about it initially since we’re so used to just taps and long presses, and you may mix up a hard and long press at the beginning, but it becomes second nature to access quick options, like calling someone in your favourites list, or to move your pointer around quickly, to name just two actions. The current drawback is only a small number of apps support it right now, but the potential is there. The difference between a long press and a hard press on the 6s Plus. Other features like Live Photos (which takes a 1.5 second video before and after you take a photo) are fun initially, but it’s designed more for personal moments like parties or people’s reactions rather than, say, landscape photos. In its defence, it’s an option that runs in the background and only appears when you request it. An example of Live Photo in GIF format. For many years, one of the iPhone’s strong points was photography. While the camera itself has received an upgrade (jumping from 8MP to 12MP) and there’s also an improvement in low-light photography, its rivals have closed the gap. To be honest, the difference between its biggest rivals like the Galaxy S6 is probably minimal at best. If there’s a difference, the colours of the 6s’s photos are more true to real life, whereas the Galaxy S6′s would be a little bit more exaggerated. This may become more apparent when the likes of Sony’s Xperia Z5 and Google’s Nexus 5X and 6P are released, but for now, if you’re judging phones on the type of camera they offer, then it’s coming down more to preference. But that’s ignoring the camera’s strengths. The interface is still easy to use, there’s rarely any confusion as to what mode you’re using or what settings you have on, and the camera boots up almost instantly. You’re not going to have trouble with it and there are some subtle improvements to help improve the quality and sharpness – and for most people, that’s all they care about. One thing that must be mentioned is the front facing camera is one of the best out there, and is of very high quality. The idea to use the screen as a makeshift flash is a clever one and is helpful in low-light situations. While the majority will likely go for the standard iPhone, the 6s Plus does deserve mention for a few reasons, although its unique features are virtually similar to the 6 Plus. The larger 5.5-inch screen is the obvious difference, but other aspects like a light double-tap of the home screen, which brings the screen down half way, is still there and genuinely handy. Yet the biggest thing about the Plus is its battery, a 2750 mAh battery is far greater than the 1715 mAH battery the 6s has – and it makes a difference. Through mixed use, it was able to last a day and a half between charges, and maybe longer if you really, really wanted to make it last. The actual size of the phone is the drawback as not everyone will be comfortable with a device that size, meaning it’s one you should try out first before you splash out on one. As mentioned at the beginning, the s series of iPhones is usually more evolution than revolution and while that’s the case, it does set a foundation for a number of features. Apple has continued to gradually add more and more to the core of iOS and with each update, it doesn’t feel as limited as it did before. 3D Touch is something that will be adapted by more developers soon while Proactive is still young and needs time to develop. While the 6s and 6s Plus are fundamentally great phones with a welcome boost to specs, what makes the iPhone attractive to people in the first place still apply here. It’s refined, simple to use, has a great camera that adapts to most situations, and an app store that is prioritised by most developers. By now, you should know the drill with the iPhone range, and chances are you already have an opinion about it, so we’ll say this much: if you’re on the 5s or older and can afford it, it’s pretty much designed for you. Those on the iPhone 6 would be best advised to wait for next year at least since there isn’t a whole lot to separate it from this version. For everyone else, it’s a solid upgrade. - Great improvement in processing power and Touch ID. - While new, 3D Touch is useful and has a lot of potential. - Front facing camera is one of the best out there. - 16GB is a pittance and no 32GB option either. - Battery life and design for both devices is virtually unchanged. - Live photos are only good in certain situations. The iPhone 6s and 6s Plus unlocked start at €759 and €869 respectively and is available at Vodafone, Three, Meteor and Apple Store. Email “The iPhone 6s and 6s Plus: Are they worth the upgrade?”. 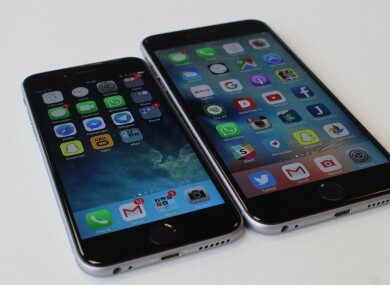 Feedback on “The iPhone 6s and 6s Plus: Are they worth the upgrade?”.